Will zombie sniping be a PC only affair? Sniper Elite v2 was actually a remake/reboot of the original Sniper Elite, a third-person sniping shooter set in WWII. Many of the base gameplay mechanics, i.e., finding an ideal vantage point to take out a key target, using some modicum of stealth to get there, and adjusting your aim based on wind/bullet drop, were still used in Sniper Elite v2, but everything got a bit of a revamping and tweaking. This included the ability to play through the entire campaign with a friend and co-op friendly multiplayer modes. While there has been a steady stream of mission packs and weapons released for the game after its release, only a small handful of these actually added to the co-op (and those were only for the PC). The recently announced Sniper Elite: Nazi Zombie Army is, again, welcome news for PC players, but seems to leaves console players in the cold once more. We decided to go straight to the source, developer Rebellion, and ask them about Sniper Elite v2's pedigree and if we can expect a console release for Sniper Elite: Nazi Zombie Army. Co-Optimus: With Sniper Elite v2, why do a remake instead of a sequel? Rebellion: Sniper Elite had a great setting that gamers really responded to. With Sniper Elite V2 we reset the World War Two timeline to fit in with the slightly different feel of the game, so while SEV2 is a new title and theoretically could be considered a sequel, we refer to it more as a reboot. Co-Optimus: When was the decision made to include co-op in Sniper Elite v2? What kind of challenge did that present when developing the game? Rebellion: From the very start we intended to deliver a strong co-op experience and making the campaign playable in co-op was a key aim. The challenges were a fun stretch goal for the title that we’re delighted we got in place. Co-Optimus: Were there other co-op modes you thought of or wanted to try out in addition to the three in the game? Co-Optimus: Did you get inspiration from any other co-op games while working on Sniper Elite v2? Rebellion: Not specifically co-op games and nothing specific I can think of for co-op inspiration. We spent time looking at a range of titles in the genre such as Gears of War, Splinter Cell series and Ghost Recon-type games. Co-Optimus: Playing through Sniper Elite v2’s campaign mode solo has a very different feel to it than doing so in co-op. Solo play feels stealthy with occasional frantic moments while co-op feels a little more rowdy as there’s a buddy there to back you up. Co-Op also has these great moments where you’re lining up shots to take down enemies simultaneously and calling your shots out. Was there any thought given to changing the co-op campaign slightly or adding some specific co-op features like “co-op snipe shot”? Rebellion: We aimed from the start of development to make sure the single player experience could be supported within the co-op campaign. The ‘resuscitate’ feature was added to encourage players to stick together and assist more in teamplay. 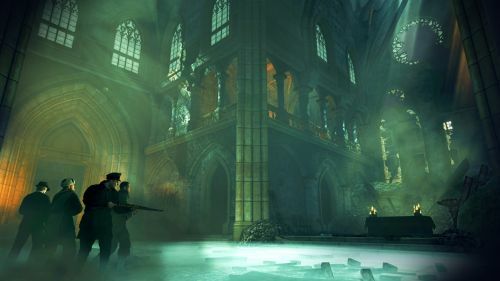 AI positions at times were tailored for a co-op encounter, allowing players the opportunity to discuss tactics.